The UN Sustainable Development Goals (SDGs) are one of the biggest trends in sustainability, attracting interest across the spectrum, including the private sector. They include 17 goals and 169 targets, reflecting a comprehensive summary of the challenges our society faces that we must address in order to create a more equitable and sustainable world. However, how will we achieve all these targets by 2030 considering the level of ambition and complexity? To consider these in context, let’s look at an example: the implementation of a project in Africa to deliver water filters to households that lack access to safe water. Such a project clearly contributes positively to the SDGs targets: providing access to water target (6.1), ending preventable deaths of newborns and children (3.2) and protecting local forests ecosystems now that people don’t need to cut trees to boil water before drinking. But wait… we prevent death of children by providing them with access to clean water, right? Aren’t forests ecosystems also instrumental in providing clean drinking water to communities—potentially reducing the reliance on water filters in the first place? 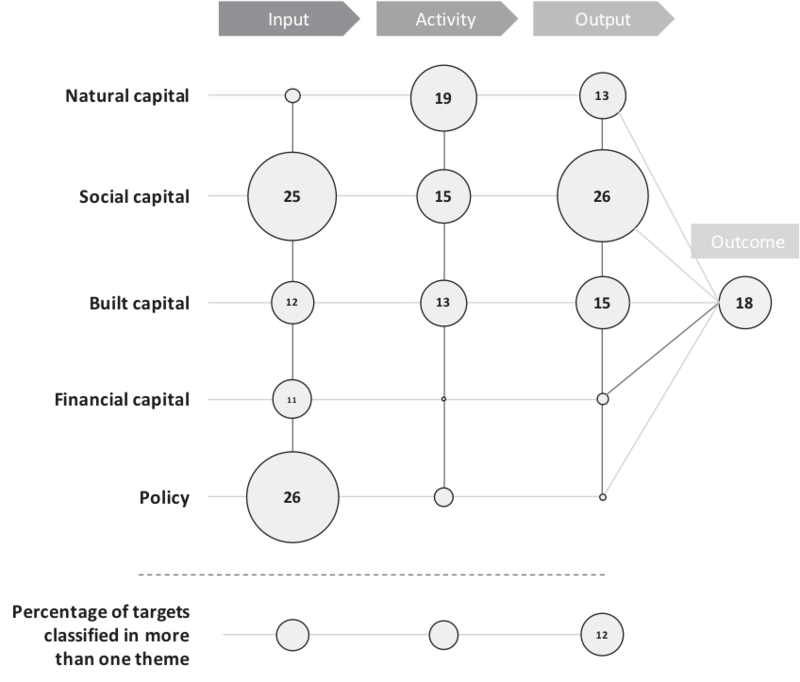 A theory of change describes how we expect a change to happen, by defining an impact pathway from the inputs that are required to run an activity, the activity itself and its outputs as well as the outcomes. Revisiting the example of the water filters project, the activity of providing water filters delivers the output of clean and safe water, which potentially delivers the outcome of preventing children’s deaths. In this case, conserved forests should be considered an input into the activity of providing safe drinking water, as illustrated in the figure below. The link between access to clean water and prevention of children’s deaths is not clearly delineated, as there might be additional parameters that introduce sources of unsafe water used during a day, such as inadequate storage of the filtered water. Thinking of the outcomes we want and how we reach them is important to most effectively deliver the changes according to SDG targets. Simply delivering clean and safe water is not enough to guarantee an outcome. And additionally, if both the delivery of drinking water and the prevention of children’s death are accounted for against their respective targets, double counting might occur as both indicators are linked. Looking at the SDGs more closely, we observe an emerging pattern. Fewer than 20 targets are actually related to outcomes. Most are about input, output and activities, as shown in the infographic below. This shows how the SDGs targets are structured, interconnected, and helps demonstrate how we will use them to deliver real change. Delivering water filters in Africa drives positive outcomes, without a doubt. But what is the environmental cost of producing the filters in China, extracting raw materials and oil for their production and shipping them to Africa? What is the impact on the household finance to purchase the filters? What is the impact on the balance of payment of the country in Africa due to the greater import of goods, including the water filters? All challenging questions, rarely addressed in these types of projects as we tend to focus mostly on positive outcomes. But it is equally important to consider the negative impact, with an aim of managing and minimizing negative impacts and maximizing a net positive impact. Within the 169 SDGs targets, I observed 152 direct negative influences or trade-offs between targets. Said differently, to achieve one selected target, we might reduce our capacity to achieve other targets. As an example, degraded environment or natural capital often is the result of ‘positive’ economic growth. Or in the case of the water filters, we might reduce the financial resources of the households by selling them the filters. On the other side of the coin, the 36 targets that relate directly to natural capital influence positively more than 50% of all 169 targets. Linkages—positive or negative—need to be considered and measured. The water filters sold in Africa delivered positive change, but how much exactly? And more importantly, are we certain that the positive change was significantly greater than the negative impacts? Recent developments in sustainability metrics and methodologies mean that we can now more accurately and holistically quantify changes in our society. One approach quantifies the value of the different outcomes using monetary units. Using this technique, we observed a societal benefit greater than USD 35 per dollar invested in the water filter project, mostly due to the health benefits (reduced diarrheal diseases linked to improved water sources). On the negative side, we measured a negative impact below USD 1.5 due to environmental externalities cost for the production and transportation of the filter, as well as due to the impact on the household finance. Methodologies such as the Natural Capital Accounting, Life Cycle Assessment and Social Return On Investment are all methodologies able to tackle the necessary but challenging measurement needs. Without good metrics, we cannot ensure that we are progressing in the right direction. Finally, one of the biggest forces of change comes from our economy and the businesses that drive it. There are 120 million companies in the world, contributing to 60% of the global GDP. If the SDGs are to be achieved, we must ensure that all companies integrate the SDGs fully throughout their business models. The SDGs cannot be a topic only addressed through “CSR,” philanthropy, or even isolated sustainability initiatives. Businesses have to transform. Reporting of companies on their sustainability strategy is a good indicator of the uptake of sustainability targets included in the SDGs. Currently, more than 8500 companies use the sustainability guidelines from the Global Reporting Initiative (GRI). Around 4500 report to the Carbon Disclosure Project (CDP) to demonstrate their climate impact and strategies to mitigate it, and 1845 companies are listed in the Dow Jones Sustainability Index. This means than only a fraction of companies—less than 10% of listed companies—are currently reporting on how they address sustainability. Despite all the news we see in sustainability related media, we are still at a very low level of maturity overall. This is corroborated by another study I led with the World Business Council for Sustainable Development (WBCSD) last year, which reviewed all the sustainability reports from WBCSD corporate members and assessed their level of maturity regarding specific topics such as water, biodiversity, soils and others. We observed that the overall maturity in term of assessing materiality is relatively high—over 40% of companies identified biodiversity as a material impact. For water, this number reaches 70%. Although when looking at action plans and outcomes reporting, this statistic drops below 10%. Less than 5% of companies define a specific strategy for their supply chain water risk for instance. The statistic is even lower for biodiversity. Despite the high level of maturity in term of determining materiality, the deployment of actions to tackle their real environmental impact is still highly immature. These days, most companies have deployed project-based approaches, often very localized and taking a disproportionate place in their strategy—and in their communications and claims about sustainability—when assessed in terms of their entire value chain. It’s clear that it is time to integrate the SDGs within the business models of companies rather than through isolated projects. This change will not happen overnight, however. We need to start the evolution today by identifying what drives action and change at an integrated business model level rather than at the project level. For instance, the Gold Standard Foundation historically focused on projects and activities, by certifying impacts in carbon, water, and other sustainable development impacts. As they develop Gold Standard 3.0 to track to the SDGs and their indicators, the future standard should also serve as a platform for businesses to track their contribution to the SDGs based on their business models throughout their value chain.